March 1 is the ten year anniversary of The MineThatData Blog. 3,200 posts and 1,500,000 words. Anywhere between 1,500 and 2,500 are subscribed to the blog at any one time. Nearly 300,000 unique individuals have read at least one post, nearly half of the grand total read one single post in January 2007. That's the only time anything went viral. There are two things that posting five times a week give me. Practice. You get better when you write 3,200 blog posts. You don't get better as fast when you publish ten times a year. I see this pattern repeat in my work - digital folks get smarter so much faster than offline folks, simply because digital folks get to practice often and quickly. I measure everything. I've learned that almost all "engagement" and "content" best practices are invalid for the work I do. In fact, the less engaged folks are with content, the more business I tend to get. Let that one sink in for a moment if you are a content marketer or a social media guru. Frequency. Frequency is a big deal. If you aren't in the inbox, you are forgotten. I know this to be true ... I lost 1,000 subscribers when Google Reader died three years ago ... 90% of those people never came back. Early on, I realized it was going to be very hard to write honestly about what customer data was telling me. There are just too many forces that do not want an honest discussion about how customers behave, forces that make money when a dishonest view is promoted, one filled with seductive lizard logic. You know this is true, for most of the advice you've been given, when implemented, did not help grow your business. The compensation structure of our industry (vendors fund research brands, conferences, and trade journals) makes it very difficult to share an honest message without being pummeled by those who have a vested interest in protecting the compensation structure of the industry. So seven years ago, I tried something that became the most popular series on this blog. The series? "Gliebers Dresses". By writing about a fictional company, I could say things that couldn't be challenged ... what is a vendor going to do, publicly beat up Roger Morgan for advocating adherence to a Woodside Research report? Is the trade journalist going to beat up Glenn Glieber for making fictional comments like "I love free marketing?" 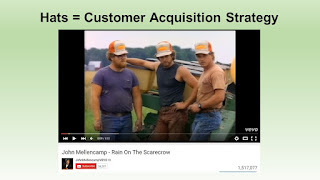 The second most popular series written on this blog are the posts that support this presentation about Customer Acquisition (click here). This has been an eye-opening learning process, folks. The most popular product I've offered is Merchandise Forensics. It's not even close. Merchandise-centric posts are in the lower quarter of "engagement", but generate a ton of business. Let that one sink in for a moment, and reference it the next time you are told to build a credible, relevant, optimized content strategy that leads to increased engagement. Repeatedly, via project work or my conversations with you, I have learned that your needs and observations are different than the mainstream pap you're being fed. You want an honest discussion about why business is tepid, and will heartily consume a fictional account of a business in order to get closer to truth. You are struggling with finding new customers at a reasonable cost, and realize that this is one of the two secrets to business success. You now realize that merchandise productivity is holding you back, and as merchandise productivity erodes, your customer acquisition activities suffer, and without a steady diet of new customers, you don't any loyal customers to retain. That's the reality of ten years of content. You want honest facts. 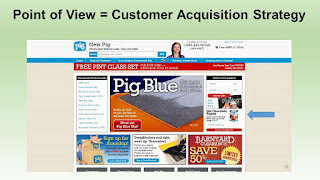 You want to learn how you might acquire new customers. You realize that merchandise is terribly critical. Ok, your turn. What do you want to see covered in the next year? What is the content that will help you the most? Why not send me an email message (kevinh@minethatdata.com), and share how long you've been a subscriber, what you've liked, not liked, and what you want to see going forward. With the VT/NH event now sold out, the way you get to see the presentation is to read it (15,000+ views now, according to their counting system, which I think is a gross overestimation of the real count, but what the heck). So click here to read it ... I've added +/- 10 slides with examples from Facebook and YouTube. I'm also being asked to make the presentation at the companies you work for ... so if you need it done that way, contact me (kevinh@minethatdata.com). It's the second-most popular piece of work I've done. I'm hopeful you are actually doing something with the information ... this is not meant to be a vapid thought leadership piece ... you are supposed to see the tactics used by your competition, and you are supposed to apply the techniques in a manner appropriate with your prospect base to find new customers via what I now call "Brand Response Marketing". Send me a message (kevinh@minethatdata.com) ... what additional slides do you want to see added to the presentation? What would be helpful to you? 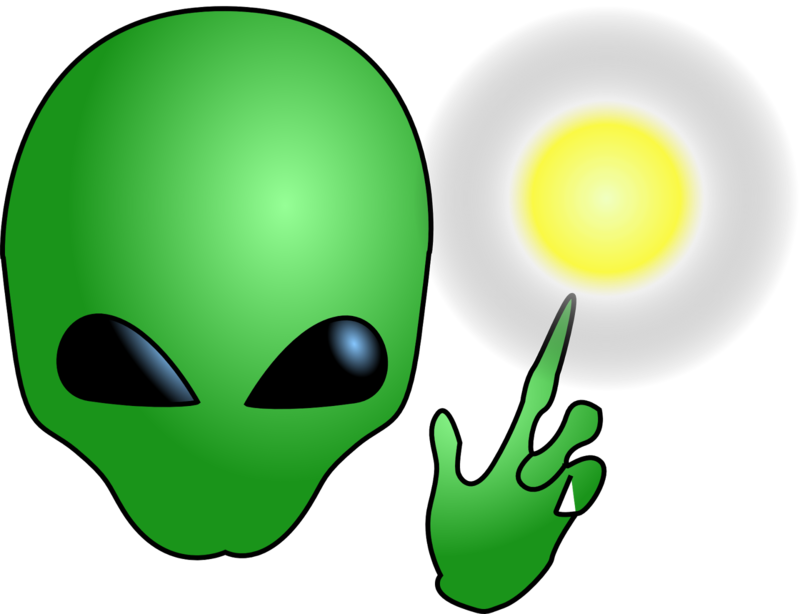 If there's one concept that has been alien to many in my reader base, it is the concept of the "organic percentage". Specifically, if I polled the readership base, it is entirely possible that more than half of you disagree that demand happens without marketing. Certainly, attribution vendors have a vested interest in proving that demand must be generated by marketing. Certainly, marketing employees have a vested interest in proving that demand must be generated by marketing. Google has a vested interest in proving that demand must be generated by marketing. So does Facebook. Some use the term "micro-moments" ... to suggest that the customer is touching 29 channels 73 times before purchasing ... and therefore, you must pay the 29 channels 73 times for each purchase. Who benefits from that? In fact, the entire vendor / trade journal / conference / research brand ecosystem is designed to get to you to believe that every order touches 29 channels a total of 73 times. This ecosystem gets paid when you believe that the customer touches 29 channels a total of 73 times. Is it any wonder, then, that so many of you struggle with the concept of the organic percentage? Every message you hear out of the vendor / trade journal / conference / research brand ecosystem runs contrary to reality. Reality is, of course, that orders happen without the need of marketing. You drive past an Olive Garden, you are hungry, you stop by. Somebody will demand that an Olive Garden commercial from 1997 caused you to hold Olive Garden in high regard. That may be true. It's probably not true, but fine, I'll concede. But you are hungry, and they are open, and you turn in and order something. You like the breadsticks. And two weeks later, you drive past the Olive Garden again, and the breadsticks are on your brain. You stop in again. See? The merchandise (breadsticks) cause you to visit. That is the very definition of the organic percentage. The better the merchandise is, the better the customer experience is, the better the price/value relationship is, the higher your organic percentage is. Stop mailing catalogs, stop sending emails, stop retargeting campaigns, stop paid search for a month, stop your Facebook ads for a month. What happens? If this customer segment continues to spend money, then you have just proven that the organic percentage is alive and well at your brand, like it is for the vast majority of companies I work with. 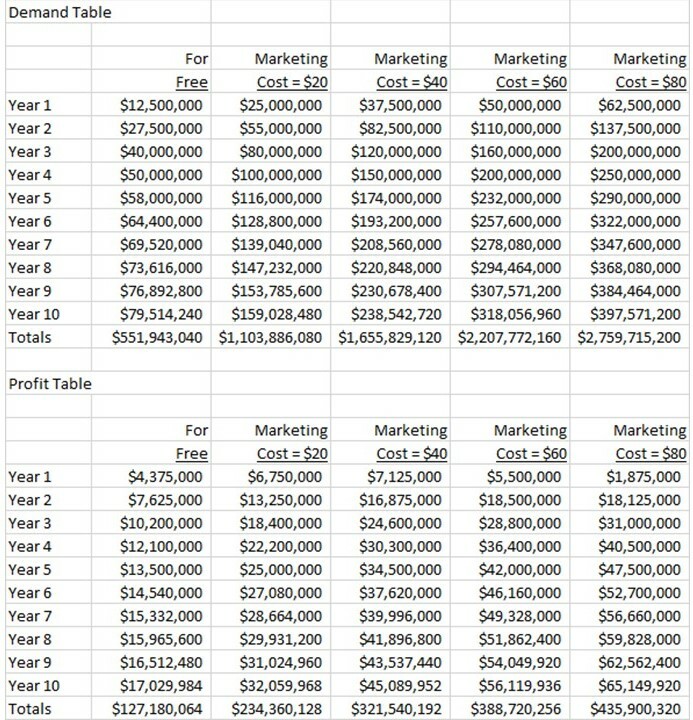 We frequently hear that most companies do not perform lifetime value calculations ... and those that do tend to largely ignore their own studies and instead invest to a twelve-month break-even (this is what I did at Nordstrom, and what I did was wrong). The right thing to do, of course, is to run a multi-year simulation, where you calculate the amount of incremental profit generated by each level of investment. 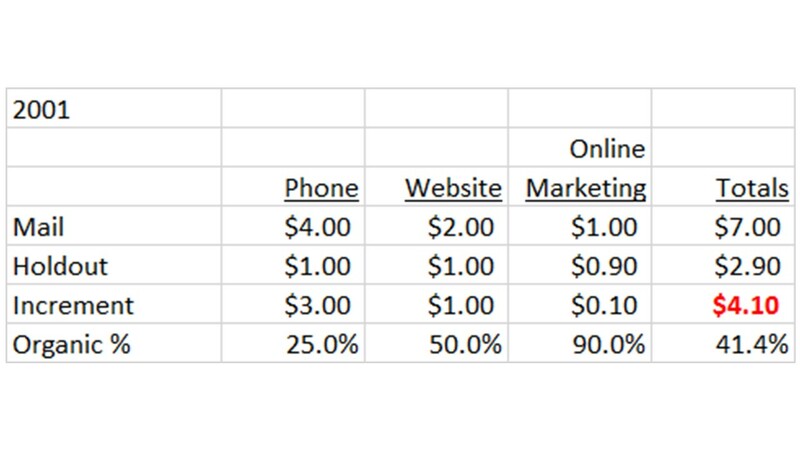 In this example, it is clear that if you want to maximize one year value, you are willing to spend $40 of marketing expense to acquire a customer, but no more. But if you want to do what is right for your business in Year Ten, you are easily willing to invest at least $80 of marketing expense per new customer. Your business is nearly twice as large, and profit is almost fifty percent greater. Now, your CFO may not be willing to invest this much money, and that's fine ... but your CFO should at least be made aware of her options, don't you think? 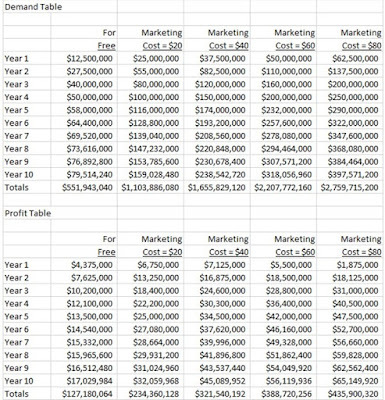 Send me an email message (kevinh@minethatdata.com) if you need help setting up your multi-year simulation of long-term growth and long-term profit. 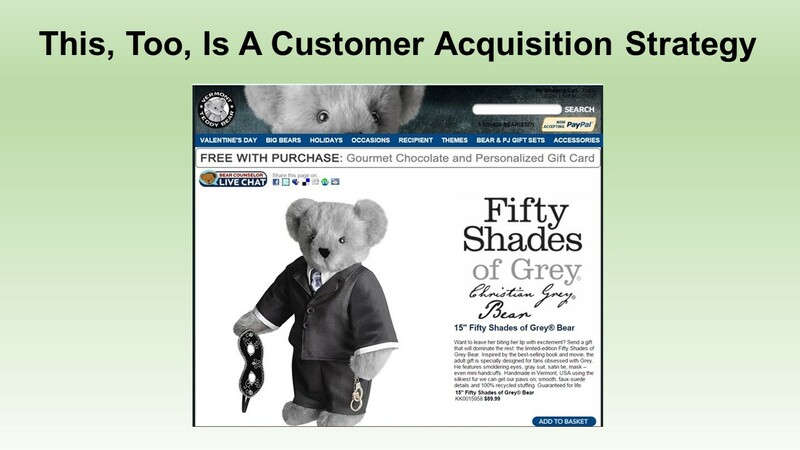 This is a slide from my customer acquisition presentation. If you watch television and still watch commercials (the pundits tell us that only 37 people still do this), then you have heard the music ... and you've witnessed the images of shivering dogs in filthy dog runs ... and you felt the lump in your throat ... and you didn't want to cry in front of your children ... and you've fought your own hand as it digs into your wallet ... grasping desperately for a credit card that eases the pain that pups feel. Yes. This is a customer acquisition strategy. I know, I know. You sell widgets. They're boring. They're dull. You don't think your customers abandon their widgets in a closet? Your widgets feel just like the pug feels in the image above. Try something. 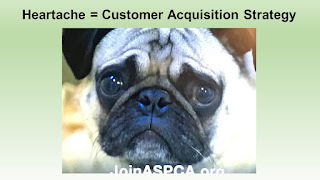 Heartache is a customer acquisition strategy. Form a Brand Response Marketing team, and try creative tactics to find new customers. Here's what happened, way, way back in 2001 when you mailed a catalog (yes, your mileage will vary - and yes, vendors will have a different point of view on this topic). Life was good! You generated $4.10 per book, 41% of the demand was organic. What do you observe? Well, productivity is in decline. But look at the organic percentages by channel. What do you see? They are the same by channel, but as demand shifts away from the phone, the effectiveness of a mailing decreases. Here's the story in 2011. 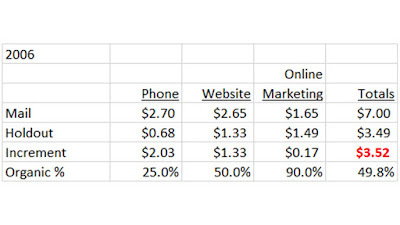 Again ... channel shift causes the overall organic percentage to increase, causing the effectiveness of the marketing technique to decrease. Again, your mileage will vary. If your customer is 74 years old, you generate a ton of phone demand, and it's like your business operates back in 2001. But if your customer is 44 years old, the 2016 example is too conservative. Read across the "Mail" row in each year. What is total demand among the mailed segment? It's the same, isn't it? If you depend upon flawed matchback reporting, well, to you, business is the same as it was back in 2001, right? Flawed matchback (attribution) reporting is a big deal. 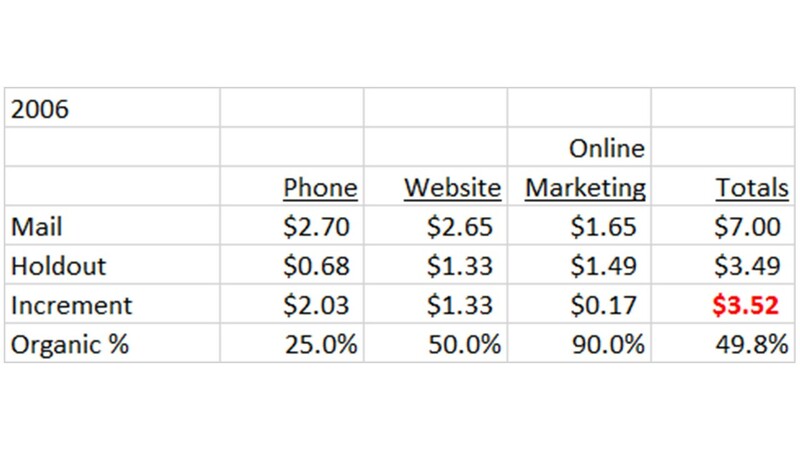 If you trust matchback/attribution and don't conduct the proper tests, you are costing your company a ton of profit. Maybe that's ok with you, but if any other employee were able to hide the truth from your CEO, that employee would be in trouble, right? This is another reason why customer acquisition efforts are so important. As time progresses, customer productivity is not dictated by marketing productivity - it's dictated by merchandise productivity. The marketer can make a big difference by planting the seeds required to bear downstream new customer fruit. This is a fascinating time to watch what is happening to retailers, to online brands, and to catalogers. Give this little ditty a read - about Nordstrom treading water (click here) and getting hammered for treading water. Since a research brand demanded that all businesses become "omnichannel", we've witnessed a series of trends that deliciously (for some) interacted with each other. Traditional Retailers dove head-first into being "digital". Traditional Retailers spent endless money integrating online and offline experiences. Customers overwhelmingly rejected an integrated online/offline experience in favor of an entertaining experience. While Traditional Retailers focused on channel integration and digital, Upstart Retailers focused instead on Merchandise + Experience. Younger customers strongly preferred Merchandise + Experience over Channel Experiences. Traditional Retailers were increasingly cut off from a flow of younger new customers. Traditional Retailers fought back as only they can - via low cost channels (think Nordstrom Rack), further submarining efforts to grow via Channel Experiences. Online brands seeking to become Digital Unicorns fully capitalized on the void left by Traditional Retail ... they created experiences that are complemented by offline/television advertising, creating awareness and generating new customers that do not prefer Channel Experiences. Research Brands, Vendors, and Consultants gave self-serving Channel/Digital advice that ran Traditional Retailers right off a cliff. Online Brands seeking to become Digital Unicorns, Amazon, and Upstart Retailers filled the void. Momentum has been established. It's hard to overcome momentum once it has been established. Oh, I know, that won't be a popular point of view. But it is hard to read a Woodside Research report or Retail Trade Journal article from the past five years and not see how the advice, advice designed to help Traditional Retailers, instead crippled Traditional Retailers ... accelerating their slump. Pay close attention to the smartest marketers out there. You won't find their strategies in Research Reports, Trade Journals, or Vendor / Consultant Thought Leadership essays, and for good reason ... those folks cannot make money off of the smartest marketers. The smartest marketers out there are crafting holistic customer acquisition programs, leveraging merchandise and experiences at a low cost. They don't look where to spend money. They don't seek to integrate channels to create great Channel Experiences. They leverage merchandise and great experiences to create New Customers, New Customers that fuel the future success of a business. They obsess about the traffic they already have. They leverage their own platforms. They don't require help from third parties to be successful. You are going to see a dramatic shift away from channels/digital ... a shift to merchandise/experiences. This is a place where the Brand Response Marketer thrives. Do you have a Brand Response Marketing Team? Your answer to that question says a lot about the future. In my upcoming presentation on Customer Acquisition, I open with a discussion of what is called "Lizard Logic". I first heard the term working at Lands' End in the early 1990s. My boss, Dave Johnson, used the term to discount comments that sounded logical but were, in fact, bad for business. I was reminded of Lizard Logic when I read an article yesterday about measuring the return on investment of an emoji (this article was the top story in an email newsletter distributed by a trade organization that is there to look out for your best interests). The author stated that this was a "very important issue" for "brands". Later in the article, the author proclaimed that, when done right, emojis generate enough engagement to be nearly equal to millions of dollars of paid media. That's the return on investment. That's what our industry wants from you. Our industry wants you to use emojis, and if you use them well, you generate engagement that is worth millions of dollars of paid media. Never mind that the millions of dollars of paid media might be worth pennies of net sales and a million dollar plus loss on the p&l. Using emojis to generate a paid media comp is Lizard Logic. You are constantly being pummeled by Lizard Logic. You are told that it is more important to generate engagement than to generate sales and profit. That's Lizard Logic. You are told to follow Macy's and become an omnichannel brand because the customer "demands it". Thanks, Woodside Research, but that's Lizard Logic. Macy's followed the logic and is now in free fall, closing stores, laying off thousands of employees who carried out your strategy. These folks lost their jobs because Management listened to Lizard Logic. You are told that your message must be personalized and relevant, but you are told this via an email campaign from a vendor selling personalized and relevant solutions ... and the email campaign is not personalized. That's Lizard Logic. You attend your favorite conference ... and the speaker is from a reputable vendor ... but the vendor paid $20,000 in sponsorship fees to earn the right to get one hour in front of five hundred attendees ... sharing a message that benefits the vendor and generates sales for the vendor. That's Lizard Logic. The conference earns $. The vendor pays $ in order to get access to an audience that will pay the vendor $. You end up paying money to hear a biased message. 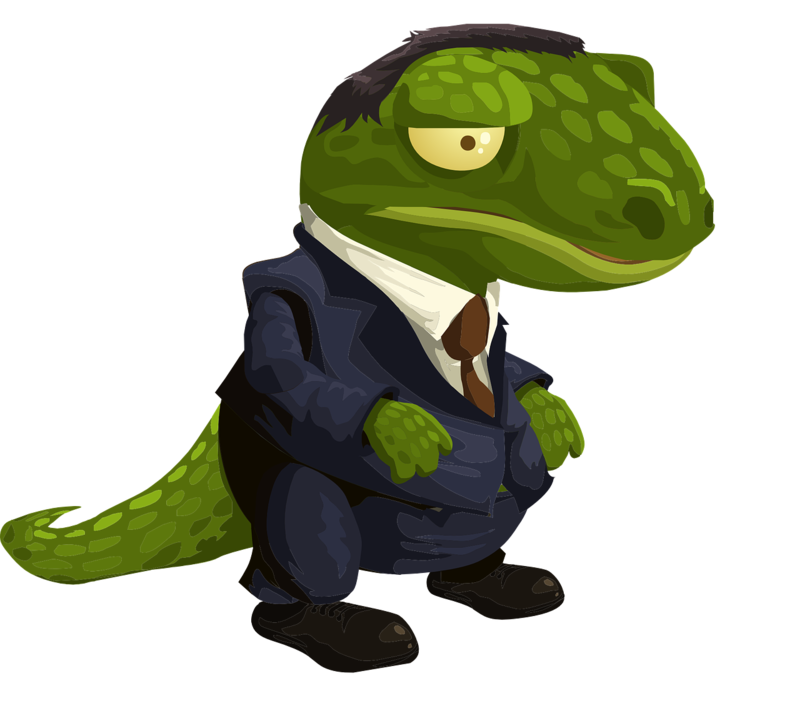 When somebody tells you that it costs nine times more to acquire a new customer than it costs to retain an existing customer, that's Lizard Logic. Say you retain 37% of last year's buyer file, as is the average across my client base. What do you do in two years when only 15% of your file is still buying merchandise? How expensive will it be to squeeze nine times the sales out of this audience to keep your business growing? Eventually, you have to get $50,000,000 out of two customers. Good luck following the Lizard Logic. Anytime an industry pundit tells you that "the customer" demands something, and "the customer" is an average across a survey of 494 "potential customers", you are hearing Lizard Logic. "The customer" is not "your customer". You are being pummeled by Lizard Logic on a daily basis. Almost all of it is designed to get you to do things that benefit those who share Lizard Logic. Your job is to do what is right for your business. In fact, New Pig clearly has a unique point of view ... about everything, don't you think? It is really, really risky to have a point of view. I should know. I take a point of view that is typically not popular with the vendor community. There are consequences for taking a point of view. I probably generate half or less of the volume I could generate if I "played ball" with the vendor community. Of course, I would have to be inauthentic ... I'd have to lie if I "played ball". So I don't play ball. I have a point of view, and I live with the consequences of that point of view. I know, I know, you sell widgets, and if you sold widgets, you couldn't possibly have a "silly" point of view. Well, chocolate piglets is a point of view ... in fact, everything about New Pig places them in a whole different sphere than their competition. Their point of view probably alienates some customers ... and brings other customers/prospects closer to them. Have a point of view. Be different. Chocolate Piglets is certainly one way to be different, don't you think? 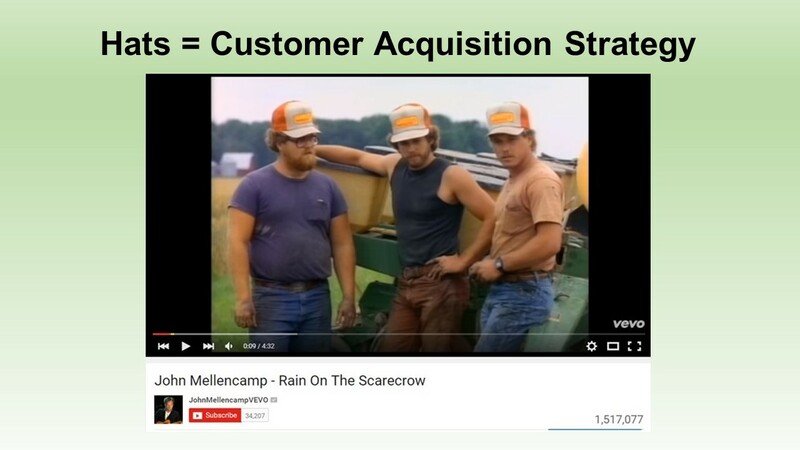 This is an image from my customer acquisition presentation. It's a screen shot from a John Mellencamp video - Rain on the Scarecrow. Notice the hats the farmers are wearing ... GARST. That's the Garst Seed Company. That's the home of my first job, as a Statistical Analyst (1988 - 1990). We gave out a lot of hats, for free. I can remember being in a meeting, probably in 1989, where a marketing person said there were two things that farmers loved ... free hats and free food. The marketing person made sure that the plant breeders, when they were canvassing the midwest in search of new customers, gave away a lot of food and a silo of GARST hats. The hats were a form of free advertising ... no different than Russell Wilson wearing Beats headphones or news/weather folks wearing L.L. Bean coats. What free advertising do you leverage? What do you give to the customer, and then, what does the customer do to spread the word on your behalf? The brand response marketer works terribly hard to plant seeds. A GARST seed company cap ends up on a music video in the 1980s. A simple, nearly free, boring cap, doing heavy lifting. What is your version of the GARST hat? I saw this product on Twitter, posted by a Financial Services professional, if I remember correctly. Now that I clicked on the item, Vermont Teddy Bear (click here) makes sure that I'll never forget the item courtesy of an aggressive retargeting program. This, too, is a customer acquisition strategy. You craft a product based on a pop culture book/movie, people talk about the item, and then those who elect to view the item on the website are tracked all over the internet. I know, I know. You sell widgets. You'd like to figure out how to align your widgets with the recent Peanuts Movie. You don't agree with the morals of what you see above. That's fine, I get it. Instead, think about a different solution that aligns with your business. This product is a merger of a Brand Response Marketing strategy coupled with a Merchandising Partnership. I highly doubt Vermont Teddy Bear has a Brand Response Marketing team, but the end result is the same, nonetheless. 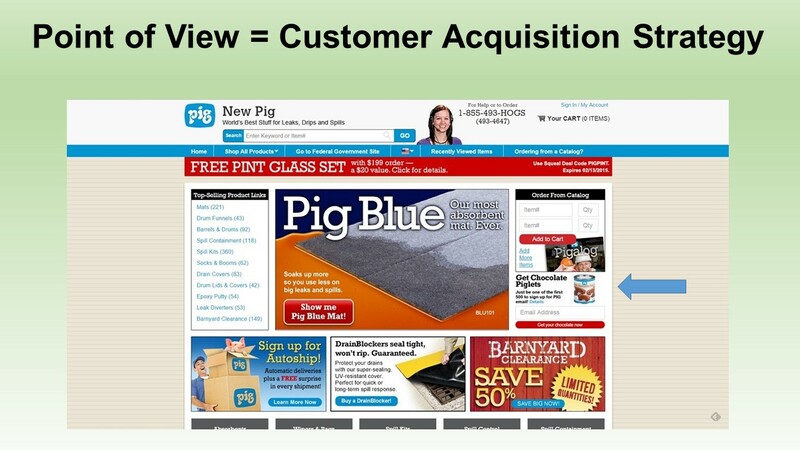 Twitter and Retargeting and the product all yield a low-cost customer acquisition strategy. There is a parallel to your business. Go make something happen!! This image from my customer acquisition presentation comes to us courtesy of Rag & Bone (click here). You visit their home page, and you are served a dollop of white space. You look at the merchandise, and you quickly realize that you will have to take out a second mortgage to afford the assortment! Expensive merchandise means that rich people are eligible to buy the merchandise. Head to Facebook (click here), and you'll see that famous people like Jennifer Lawrence own a handbag. That attracts traffic, folks. I recall being in a meeting at Nordstrom, way back in 2002. The accessories merchant was in an argument with another merchant ... and the accessories merchant was winning the argument. Her comps were pushing +10% ... and for good reason ... she was pushing prices higher and higher and higher. Her claim? She said that when you pushed prices as high as possible, you self-select an aspirational audience. In other words, she was choosing the audience she wanted to acquire via the price points offered in her category. I know, I know. You sell widgets. Widgets are a commodity item. You are under severe price pressure from Amazon and your competition. If anything, you have to lower prices! Fine. Good luck with all of that. Do you think that Rag & Bone has stiff competition? One of the fast fashion brands can knock this stuff off in less than two weeks and sell something similar for $30 instead of $300, right? 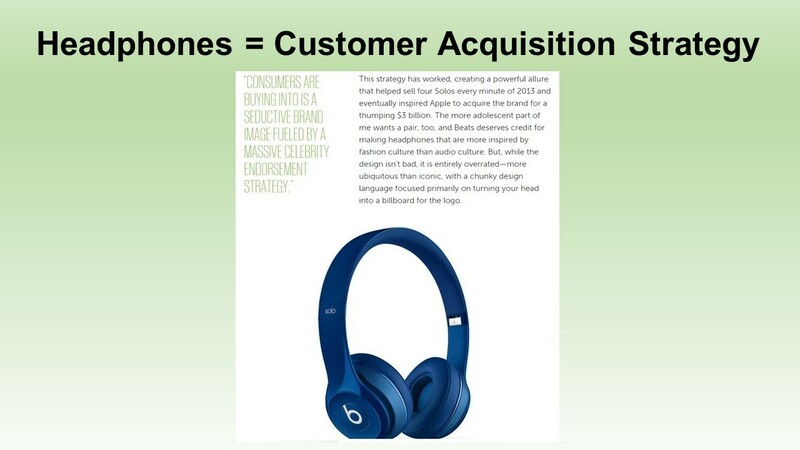 Expensive merchandise is a customer acquisition strategy. Regardless of your business model, you have expensive merchandise that your existing customer base craves, and the expensive merchandise anchors a perception among prospects. You get to pick your customer acquisition audience. 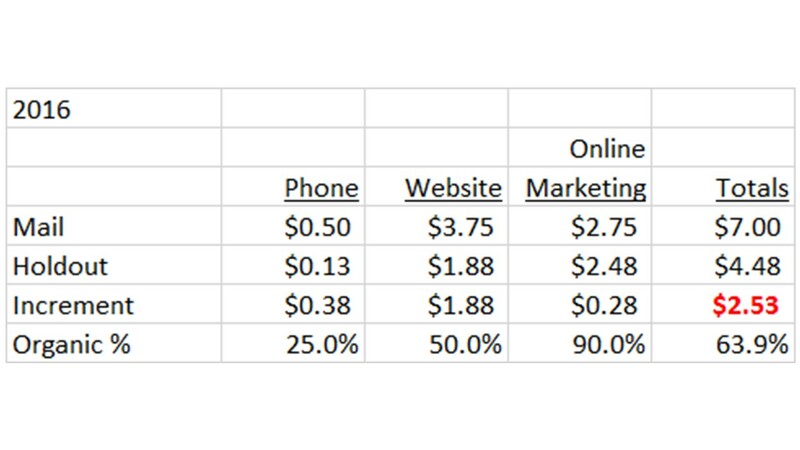 Why pick and audience that always demands the lowest price? VT/NH Marketing Presentation - March 31: Gonna Be Sold-Out Soon!! So many of you have told me you want to attend. Better hurry up and register before the event is sold out, as I'm told is likely to happen soon. Click here to be taken to the latest version of the presentation, where more than 30% of the slides have changed. Or, if you can see the slides below, please thumb through them right now. But for heaven's sake, register now and don't miss out!! If you are a marketer, you are probably exasperated with your merchandising team. They beat you over the head for contacting the wrong customers at the wrong time in the wrong way. They look at your email marketing performance and think that one customer purchasing for every seven hundred deliveries is an apocalyptic catastrophe. If you are a cataloger, then it is common for the merchandising team to blame the performance of 160 pages of merchandise on the marketer. I've been in the meetings. I've witnessed the carnage. As a marketer, you can hold your merchandising team accountable for performance. It's not rocket science. And no, you won't hold them accountable for performance with a square inch analysis. 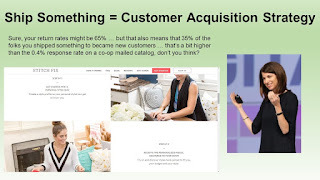 That style of analysis helps you figure out how to merchandise/paginate a catalog, and that is of the utmost importance if your organic percentage is under 30% and you care deeply about catalog response. For everybody else (which is almost all of you now), you care about a merchandise assortment that works the whole year 'round, and works in email and affiliates and paid search and SEM and comparison shopping engines and via direct load traffic. You care about an assortment that attracts new prospects. I recommend that you start simple. I will also say, right up front, that there are plenty of consultants out there who will do a great job for you and will disavow my style of analytics. Please, work with those folks. They will help you improve response/conversion. I use a concept called "Winners / Contenders / Others". Step 1 = For the desired period of time, count how many customers purchased during that time frame. Step 2 = Now, sum total demand per item, and total units per item for that same time frame. Do this for each item. Step 3 = Divide demand by customers. Divide items by customers. 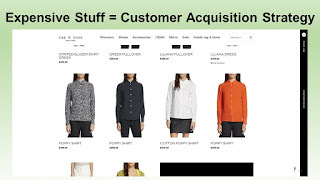 Step 4 = If an item is in the top 5% of all items for demand/customer or it is in the top 5% of all items for items/customer, the item/style is deemed a "Winner". 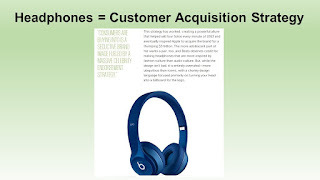 Step 5 = If an item is not a "Winner", but is in the top 45% of item performance in terms of demand/customer, then the item is deemed to be a "Contender". Step 6 = All items not classified as a "Winner" or a "Contender" are segmented as "Other". Using this simple framework, you'll see that +/- 40% of annual demand comes from a handful of "Winners". Another +/- 50% of demand comes from "Contenders". And then you have 55% of the assortment that contribute +/- 10% of annual demand, and are generally not worth measuring. Perform a simple longitudinal study of Winners / Contenders / Others by Category. 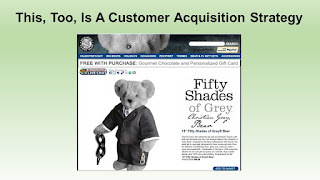 This simple analysis is going to tell you if you have a merchandising problem. Count Winners over time. In almost all merchandising challenges, you'll see a reduction in Winners, a reduction that is often sourced from poor new item performance from 1-3 years earlier. When I bring up the topic of Brand Response Marketing, I am occasionally greeted with the expression seen here. It's an expression of doubt and "we've tried this before, and it didn't work, so please give me a great idea, for free of course, that is guaranteed to work, because my entire career is now dependent upon free advice from outsiders and $1,795 reports from Woodside Research." When I worked at Eddie Bauer, circa 1995 - 2000, I was part of what was called a "Catalog Business Team". It was the "Triple-A" of Management, and I mean that in the most positive way possible. This team had at least a half-dozen key members. Me - Director of Circulation / Analytics. The team met for two hours every Wednesday. The team went over current business. The team had three or four VP "mentors" who occasionally attended ... especially when business was bad or when we were taking risks. Once a quarter, we presented where we were taking the business to the Executive Team. We were pummeled, we were questioned, we were praised. Now, don't get me wrong. There were four layers of Management above me ... a DVP of Marketing, an SVP of Marketing, a EVP of Global Brand Direction, and the CEO. Anything we wanted to do could (and was) vetoed by our VP mentors, or by the four layers of leadership above me. That's life. Regardless, we largely came up with the tactics and strategies that were implemented. Even when folks disagreed with me, I still mostly did what I wanted ... 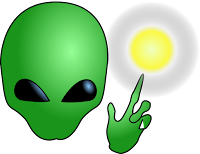 I mailed who I wanted, I forecast the business the way I wanted, I applied discounts/promotions the way I wanted, I assigned page counts per mailing the way I wanted, I created edited/smaller catalog versions the way I wanted. Tactics were modified, discussions happened, angst occurred. In the end, we posted the most profitable year in the division of the catalog / e-commerce channel (back in 1999), best results in 50+ years. In other words, the org structure worked. Fast forward to today. What a mess. I keep seeing situations where classic direct marketers hold our businesses hostage by demanding immediate return on investment. Similarly, I keep seeing situations where brand marketers swing for the fences, spending millions "building a brand" with no return on investment whatsoever. I see digital experts who have no idea how business works. I see business experts with no idea how digital works. I see tepid sales growth. I see frustration. What we need today is a Brand Response Team. Here's what I recommend. Only employees age 30-39 are eligible. When an employee hits 40, the employee must move on. This keeps modern marketing concepts at the forefront. Your mileage will vary. But the last thing you need is a crusty fifty year old like me holding the company back. Cross-Functional ... make sure Finance, Merchandising, Creative, Online Operations, Classic Direct Marketing, Digital / Online Marketing, IT, Inventory, Social Media, Mobile are all represented. Director-Level Recommended. Make sure that this is the training ground for future leadership positions. Authority. This team gets to make real decisions, they are not pawns on the Executive Chess Board. Otherwise, why do this at all? Accountability. This team owns Customer Acquisition, pure and simple. They OWN it. They are given a budget, they are given a customer acquisition count target, and they are given a profit target. When they succeed, they are promoted. When they fail, they are booted off the team. Bonus. This team earns at least a 50% annual bonus if customer acquisition targets are met. I know, you hate this. Tough. Pay people for outstanding performance. Now, when you have a team with the six (6) criteria above, do you think this team will blindly allow a paid search vendor to own customer acquisition? Do you think this team will let the co-ops be responsible for 85% of new names? Never!! This team will approach Customer Acquisition with the necessary zeal required to grow a modern business. This team is called a "Brand Response Team". Their number one job is to profitably grow new customer counts. By doing this, the Brand Response Team guarantees the future success of the business. I know, I know. You sell widgets. Your Executive Team has an iron-fisted approach to Management - they tell people what to do, not the other way around. Ok, then, good luck to you. But for the rest of you, those of you with open minds and an appreciation for future success ... what would stop you from forming a Brand Response Team? As you've heard me #testify, in 80% of my Merchandise Forensics projects, there is a problem where customers are spending less, and they are spending less because of merchandising issues. Increasingly, folks want to know who is spending less. That answer "depends". In this case, look at what happened in months 12 - 30 (i.e. 1.5 to 3.0 years ago). Look at the bottom of the twelve-month buyer file ... between the 0th and 20th percentiles. These customers were spending 30% less than they were spending four years ago. Notice that their spending declines started first ... they were the harbinger that problems were brewing. 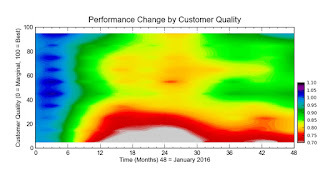 The problems didn't get to the top of the customer file until several months later ... the problems were not as dire ... and the recovery was just a bit stronger than at the bottom of the file. You are probably already running a comparable analysis, and you probably know who is spending more/less over time. 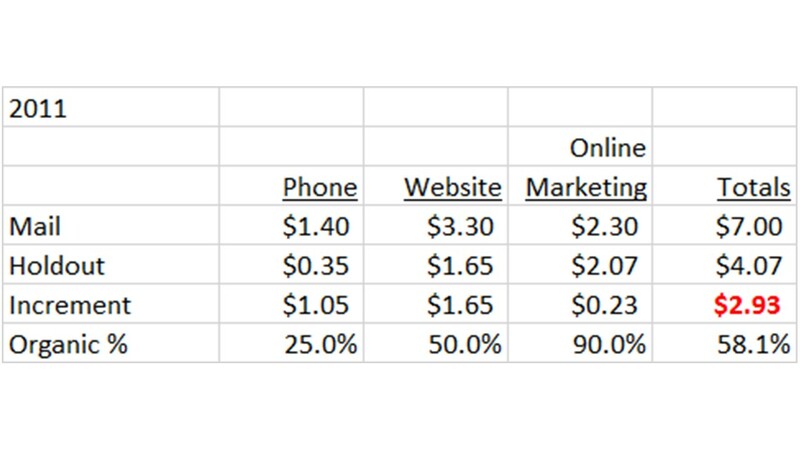 It's more dire when best customers spend less ... but sometimes, when marginal customers spend less, it is because a handful of key products that marginal customers like are discontinued. Your business is not succeeding/failing because you are not on the cutting edge of programmatic ad buys. Your ad buys are not working because of missteps in your merchandising strategy. Use your comp segment framework to understand who is spending less, and why. Have you ever attended the Internet Retailer conference? Or Shop.org? You know, we read too much about pointless omnichannel tactics and strategies ... almost none of what we're told to do works. Nobody wants channel alignment, for if customers wanted channel alignment, Macy's would be posting +10% gains. But trade organizations, these folks actually execute credible omnichannel tactics, don't they? Internet Retailer has a series of publications they sell. They write stuff about online brands every day. All of their efforts integrate with their annual summer conference ... something nearly all of you reading this post have attended. Think about the conference. They get big time speakers ... many conferences even get speakers to pay to play, don't they? They have a vendor hall where you are hawked by folks who paid tens of thousands of dollars to be able to encourage you to pick up a free laser pointer in exchange for hearing about "programmatic". Trade journalists cover the conference and spread the word on behalf of Internet Retailer. Attendees tweet about the event, spreading the word for free. All of this nonsense is designed to keep Internet Retailer in business. It's an actual, viable omnichannel strategy, isn't it? But the event is the heartbeat of the whole thing. Without the event, there is not nearly as much to get people (you) excited about during the year. In e-commerce, retail, and catalog marketing, events are completely under-utilized. Think about Fashion Week. This is an extravaganza designed to get retailers to carry the merchandise that fashion brands want to sell. And it works! Free advertising everywhere, digital and analog. The Men in Blazers hosted BlazerCon last November ... their podcasts and TV show and conference and merchandise and newsletter all work together, creating buzz and new customers (listeners) in the process. Both loyalty and acquisition are rewarded. I know, I know, you sell widgets. Nobody wants to come to a two-day event to hear the latest in the world of 3D Widget printing. If you have 100,000 twelve-month buyers, you have 300 buyers who adore you and would attend your event. Bring in your vendor partners, make them stars in your industry during the course of a year or two, and then when you host your event, the names will be recognized and adored and will generate interest. You get all of this free advertising in the process, free advertising that generates new customers. Go hire a brand response marketer, and get busy creating an annual event that your customer base cannot help but want to attend. You attend Internet Retailer and Shop.org, don't you? Do you love those organizations? No? And yet, you attend. Why wouldn't the concept work for you business. Customer Acquisition is the biggest challenge we face in 2016. Do something different. There's Julie Bornstein, of Nordstrom / Sephora fame, shipping something to prospects at Stitch Fix. You take a quiz, and a personalized assortment is shipped to the customer. I know, I know. You are unique. You are different. You sell widgets. Why would a customer ever fill out a quiz that enables the customer to receive a personalized set of widgets? I get the chance to analyze continuity programs ... you know ... programs where customers receive monthly shipments of stuff they don't even know they want yet ... or stuff they know they want and are happy to receive. Either way, the Stitch Fix example is really nothing more sophisticated than the old "receive twelve VHS movies free" concept that caused a customer to receive movies for a full year. It's just a modern twist on an old concept. I know, I know, you think continuity programs only work for best customers. Not true. The concept fully depends upon what you ship to the prospect. And if the hypothesis were true, so what? 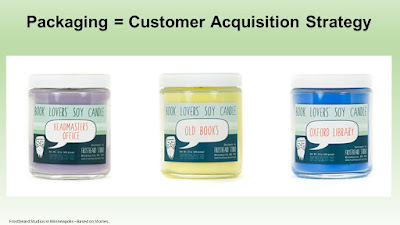 Why not use your current merchandise assortment to up-sell the customer into monthly shipments? 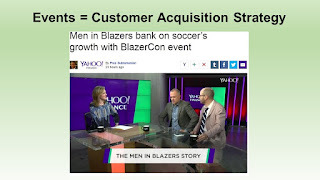 Customer Acquisition is the most important topic in 2016. We need to shake things up. We need to try different strategies. It's time to hire a brand response marketing professional and then it is time to get busy implementing different tactics / strategies. I know, I know, you believe this is an issue of semantics. You are doing the same thing they're doing, they just have a fancy title. Imagine being a 29 year old writer. 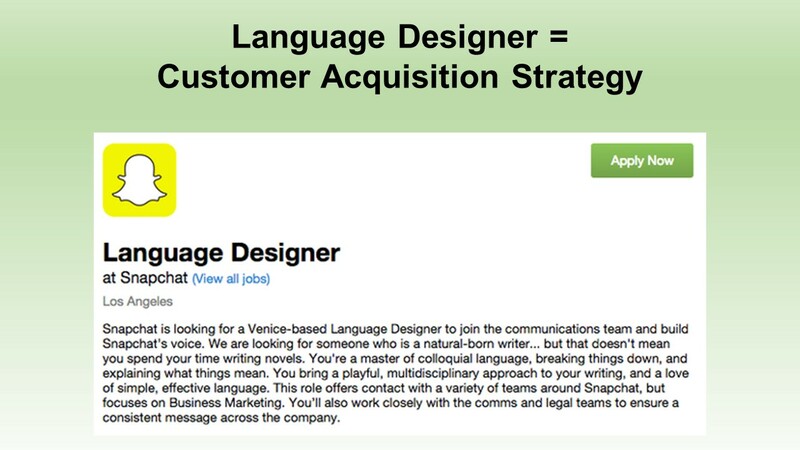 Are you likely to take the catalog job writing copy, or are you likely to become a Language Designer at Snapchat? Game over. Snapchat wins the talent battle. Now imagine that the 29 year old writer actually takes the copy writing job in Georgia ... has personal reasons for wanting to stay home and all that. Are you going to give this person the leeway to do great work? Or are you going to demand that the individual adhere to company standards? You already know the answer. You'll turn the copy writer into a drone ... and then, not surprisingly, the copy on your website reads like a text book. Who wants to read that? If you want to acquire the best customers, you need to hire the best talent. In order to hire the best talent, we all need to modernize our internal structures. Nobody wants to write copy. 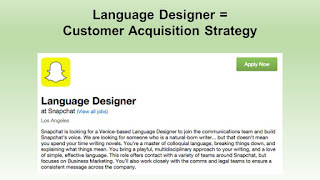 Many people want to design language. That subtle distinction pays dividends. I know, I know. You sell widgets. You are unique. You are different. You hired a Creative Director in 1997 because you watched the J. Peterman character on Seinfeld and thought somebody like that could make a difference, but the person you hired came in to work every day barefoot and wearing flannel pajama pants ... "it didn't work out, so he left the company to spend more time with family." You vowed to never make that mistake again. It is very difficult to be great a customer acquisition while writing boring copy. Do something different. You read the Shopify blog, right (click here)? They share tips for small businesses ... but of course, many of the tips apply to your business as well. They recently shared a tip about Frostbeard Studio. Stop everything you are doing right now, and go visit them on Etsy (click here). Do you put as much energy into your packaging, copy, and storytelling as they do? They are selling a soy candle ... heck, everybody sells candles. So, they take a different approach to their craft, don't they? Packaging and Copy and Storytelling are Customer Acquisition Strategies, aren't they? I know, I know, you are unique, you are different, you sell widgets and you tried clever packaging back in 1996 and you got product placement on Friends and sales didn't increase, so you strongly believe that this is yet another tactic that "doesn't work". You can't have it both ways. You cannot grumble that it is hard to acquire customers in a "competitive landscape buffeted by headwinds" and then assert that you've tried everything and nothing works. Either you go all-in on math (co-ops, Google, Facebook, Retargeting, Programmatic) and you create a soulless experience, or you hire brand response marketers and give them the freedom to creatively solve problems. Since the soulless experience isn't getting anybody anywhere, why not try to creatively solve your problems? 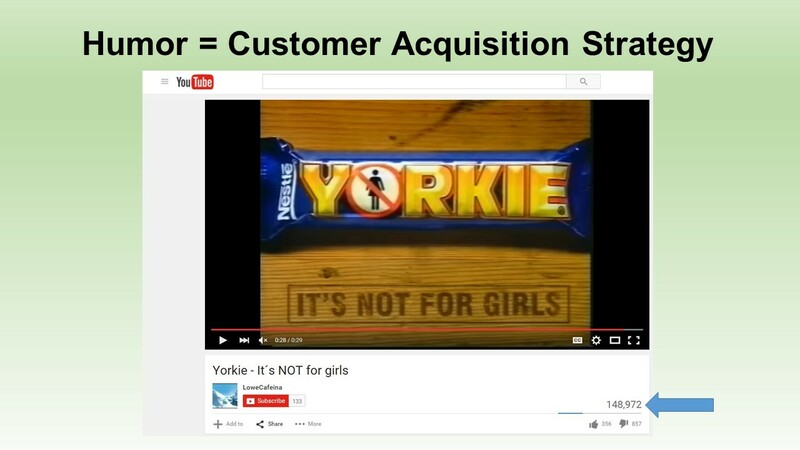 In my Customer Acquisition presentation (click here), I share a slide about humor. 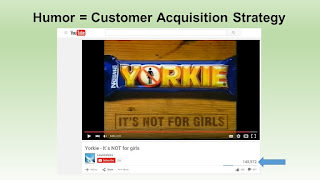 The slide features a commercial where the candy bar being advertised is "not for girls". I know, I know. Your brand is unique, your brand is different, your brand is inclusive, your brand is serious ... you sell widgets, and there's nothing funny about widgets. You tried a joke back in 1988 about Michael Dukakis and sales didn't increase. Humor doesn't work. Customer Acquisition is the biggest story of 2016. One way to find new customers is to entertain prospects. Maybe humor hasn't historically worked for your business. Is it possible what you've tried, historically, wasn't funny in the first place? I mean, I spent years working on the "Gliebers Dresses" series ... not saying it was funny, but it was an attempt at humor, and subscribers increased and it was frequently mentioned during client visits ... so it did something.